Introducing Our New Ballroom Program! 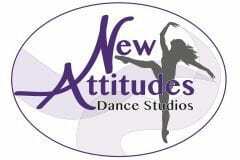 Learn to Ballroom dance at New Attitudes Dance Studios with Instructor Alexandria Riley, three-time title holder for Dancing With The Stars Marquette County! A class dedicated to the basics. This hour long class will solely be used for the purpose of catching up on some of the basic steps, no need to register for this one, stop by and drop in. This class is for couples, comrades, or partners in crime looking to up their game on the dance floor. Taught in a progressive fashion, each course is 6 sessions long and follows a specific theme. Want to learn to dance but can’t convince your partner or friend? Take this class for a chance to mix and mingle. We will change up partners often and challenge each other in a progressive fashion following a specific theme over 6 sessions. Please contact the studio for details or visit Alexandria’s website UP Ballroom Dance for more information.